It is with great sadness the family announces the passing of Ida Forth at the age of 92 in Wetaskiwin, Alberta. She is survived by her sons, Gerhardt (Lorrilyn), Daryl (Margot), Arlen (Lynne); grandchildren, Jaret (Angie), Aaron (Wendy), Kendra (Sheldon), Ryan, Melissa (Brent), Michelle, Steve (Tammy); 11 great grandchildren; as well as numerous other extended family and friends. 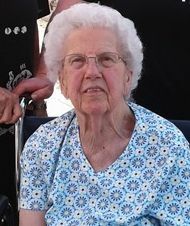 She was predeceased by her husband, Robert; parents, Adolf and Emilie Lange; son, Arly Elwyn; daughter-in-law, Dianne Forth; grandchildren, Alysha Buzzeo, Jaedyn Dietz; brother, Eric Lange. FUNERAL SERVICE: Grace Lutheran Church, officiated by Pastor Fred Schneider, on Wednesday, April 3, 2019 at 2:00 p.m. In lieu of flowers, donations may be made in Ida`s memory to the Grace Lutheran Memorial Fund or St. John’s Lutheran Church (Pleasant Prairie) Memorial Fund. Our family chain is broken and nothing seems the same. But as God calls us one by one the chain will link again. Her memory will be cherished forever.